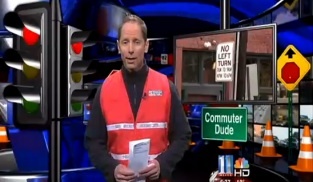 When I started working at WXIA, I learned I’d be working alongside a guy called “Commuter Dude.” That would be his on-air name. 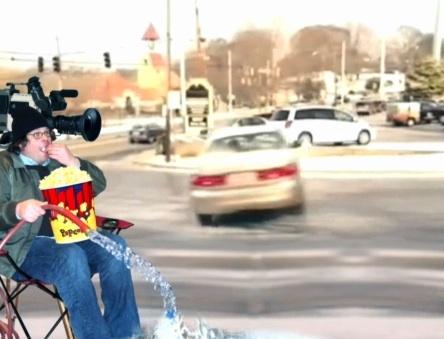 He’d cover viewer gripes about roads and such. He’d wear a reflective vest on camera. “Sounds kitschy,” I thought. As a supervisor told me about the Commuter Dude, I fought mightily to suppress a skeptically raised eyebrow. Now I’m a fan. When the Commuter Dude’s stuff appears on my TV set, I’ll stop and pay attention. I’m especially a fan of this as an interesting alternative to the drumbeat of mayhem and breaking “news” that remains the common currency of local TV. Maybe the Commuter Dude isn’t covering an issue in my neighborhood. But whatever its location, I can relate. I can’t relate to garden-variety fires and traffic wrecks because they all sound and look the same. The Commuter Dude is a guy named John Gerard. Gerard is a low-key, self-effacing guy to whom the word “dude” is a natural description (not in the classic Western sense, but in the “hey dude” 2000s sense). Gerard mostly shoots his own video on an eggplant-cam. He has an abundance of material to cherrypick from his inbox / tip jar. But his job isn’t easy. Covering hiccups in signage, traffic lights, traffic engineering and asphalt can turn quickly into one-note storytelling. Gerard strives mightily to avoid that, and succeeds more often than not. And in this piece, Gerard actually went to court with a motorist who’d been ticketed for disregarding a “no left turn” sign that had disappeared from an intersection. The court threw out the case. 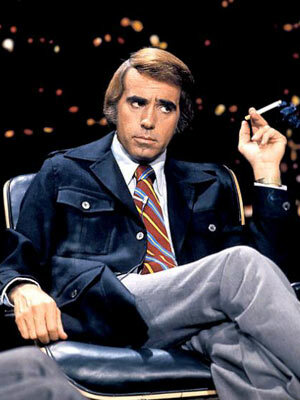 Gotta like any TV news goon who actually helps right a wrong. Gerard does this stuff all the time. Gerard’s involvement in fixing trouble spots results in a lot of first-person reporting and writing. This can be an awkward device. It would be obnoxious in a more ego-driven personality. Gerard isn’t much of a chest-thumper, thankfully. Which is part of the reason why I’m a fan. This entry was posted in gerard john, WXIA on January 26, 2010 by live apt fire. The Daily Show has become a go-to for exposing misleading video in the TV news biz. When Fox News transposed rally footage in Washington, showing a larger crowd than actually attended, the Daily Show nailed them. Yet the Daily Show does its own sleight-of-hand in editing a comedy bit featuring footage shot by a Weather Channel photog depicting the Atlanta showflake-and-ice event earlier this month. Jon Stewart shows video recorded in Midtown at the intersection of Monroe and Virginia, and questions why the photog didn’t “throw down some rock salt” instead of doing his job. Note how Stewart’s video editors deftly relocated the “look out!” warning so that it’s audible just a few milliseconds before the crash. Compare it to the actual Weather Channel video here, where the photog’s utterance is heard a full second earlier. Stewart calls the warning “lame and quite late.” But the editing makes it seem later than it really is. Not by much. But, still. It’s doctored. But the conclusion is flawed. The photog had a natural reaction to what he was seeing, and did a far greater service to the community by documenting the icy roads than he would have done by throwing down rock salt, which I’m pretty sure wasn’t in his grab-bag of photog equipment. Nailed ya, Daily Show! Oh, snap! It’s peanut butter jelly time! This entry was posted in daily show on January 24, 2010 by live apt fire. OK, that would be a broad overstatement. The truth is, I miss it. I also suspect Mr. Winne, once again a respected competitor, doesn’t mind the attention. So here goes: The return of Winne Watch. “J.J. 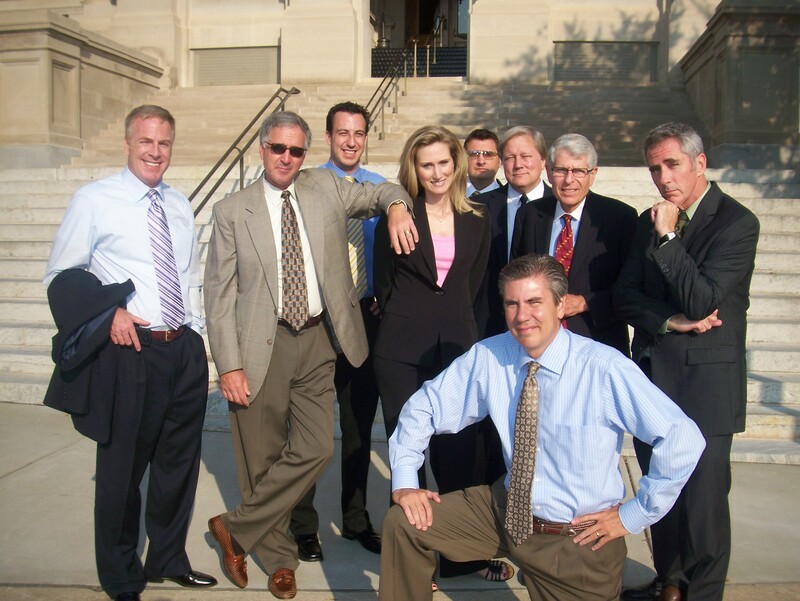 was shot in the face at a fish fry on Father’s Day weekend.” – Mark Winne, WSB on December 18. This entry was posted in winne watch on January 21, 2010 by live apt fire. John Cater had been a freelance reporter at WXIA, WGCL and WSB. He died Tuesday; an unknown illness hospitalized him at Thanksgiving. An infection developed. He never shook it. Talk about a life cut short. Cater was 32. I didn’t know Cater. He made it into this site twice, once during his coverage of a Tea Party event; the other, for his coverage of the Botanical Garden accident. Both references were mostly complimentary. Amani Channel reports that Cater attended last spring’s NABJ conference in Tampa. 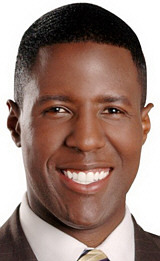 “Though I didn’t know him well, I’ll remember his wide smile, his positive outlook, and he was a true broadcast professional,” Channel writes in My Urban Report. This entry was posted in WGCL, WSB, WXIA on January 20, 2010 by live apt fire. It had been two and a half years since I’d covered a killing. In this case, it was a shooting rampage, fatally injuring three people at Kennesaw’s Penske facility. “You’re on victims / family,” read the text message. It was inevitable. I’d worked five months at WXIA and had successfully avoided such stuff until Wednesday. The desk had found the address of one of the victims who’d been shot dead by the gunman at Penske. We drove up to the house in an unmarked vehicle. A man in his thirties was working on his pickup truck in the driveway, the son of murder victim Van Springer. Our car stopped. I walked up and introduced myself. He gave me a hard look. I was matter-of-fact: “Sorry for your loss. You know that this is news and we’re covering it. If you, or somebody in your family would like to talk to me, we can portray Mr. Springer as someone substantial. Right now, he’s a name on a list of victims.” My words sounded hollow to me. I could only imagine how they sounded to him. He wasn’t buying. Some do, some don’t. Some victim families want to speak publicly about their loved ones, suddenly thrust in the news because they died horribly. Others react with anger, and the presence of the news media gives them an opportunity to lash out. I considered myself fortunate that my unsuccessful conversation with the gentleman was still civil. “Before I go, may I ask to see a photo of Mr. Springer? It helps to give the victim a human face.” I’ve never mastered the spiel in such circumstances. I figure the less I say, the better. The man’s gaze softened a bit. “Let me go ask my wife.” He disappeared into the house, then returned and said his wife would find a photo. As I stood on the sidewalk, a crew from WGCL appeared. Harry Samler walked up. I told Harry that the family wasn’t interested in talking to us, but was digging up a photo. Then the man piped up: “If we talked to you, what would we say?” Samler and I took turns explaining that a few words describing their loved one would help convey the depth of loss sustained. “I realize that goes without saying. But it gives the story context when we know something about the victim and it comes directly from somebody who loved him.” Once again, the words seemed lacking. You’d think that a guy with my experience would have a rock-solid spiel memorized for such circumstances. The wife emerged with a photo. She and her husband wanted to talk to us, she explained. But they wanted to discuss it first with the widow, who was making funeral arrangements. She suggested we check back a few hours later. We returned a few hours later. Nobody was home. We parked a few houses away, waiting for the son and daughter-in-law to return. A competitor drove up in a garish, brightly marked live truck and spotted our unmarked car. We spoke; the competitor lacked the photo of Mr. Springer. I spilled what I knew: The family was considering talking on TV, and had already provided us with a photo. They would probably return shortly. A car drove up to the house. The competitor pulled up to the house, anxious because their deadline was approaching. Our car stayed back. A man I hadn’t seen before appeared on the lawn with a cane. The reporter emerged from the competitor’s truck. The man began angrily waving his cane. I couldn’t hear the conversation, but the communication was clear: Leave us the hell alone. The son and daughter-in-law, who were so gracious to me, entered the house and said nothing. The competing reporter retreated to her live truck, which drove off. “That was rough,” the photog told me later. This scenario is typical. Reporters must ask family members if they want to participate in stories about their murdered loved ones. Sometimes they are grateful for the opportunity to speak publicly about their loss. We won’t know until we ask. Frequently, there is disagreement within the family. Almost always, the most emotional voices prevail. If one family member wants to lash out at the media, the other family members won’t stop them. They already have enough on their plate. And it almost doesn’t matter how talented or experienced or aggressive or sensitive the reporter is. Because it’s the family’s call. I finished that day with a dull headache. Comparatively, my pain was minor. This entry was posted in WAGA, WGCL, WXIA on January 17, 2010 by live apt fire.